There is substantial research available which indicates that muscle atrophy begins within 24-48 hours following injury/surgery. Research also demonstrates that when rehab is delayed, there is increased swelling due to lack of movement, loss of muscle control and joint stability and increased stiffness of muscles and tendons. Full weight-bearing activities would often be limited for weeks after surgery, which extends your pets recovery time considerably. 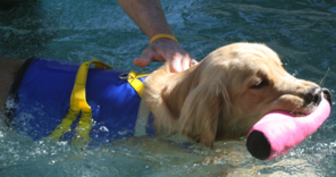 Pool therapy allows rehab to begin immediately or very soon post-surgery/injury. How quickly therapy begins is based on your veterinarian's recommendations.